Father and son (or Grandpa and Grandson) will enjoy teeing off together in their matching "Big Guy / Little Guy" golf shirts. Select any cartoon adult and child and personalize it with their names. Customize the headings too. Price is for a set of 2 shirts, one adult size and one child size. A perfect gift for Father's Day! We will send an e-mail preview of your T shirt design within 24 hours. Please check your email as we cannot print your order until we get your approval. Available in child and adult sizes. Click any age range to see the available options. Make note of the HEAD NUMBER shown beneath the one you choose. For example, B4, B10, etc. Kids are available with fair, medium, or dark skin and blonde, brown, red or black hair as well as glasses and a variety of clothing options. 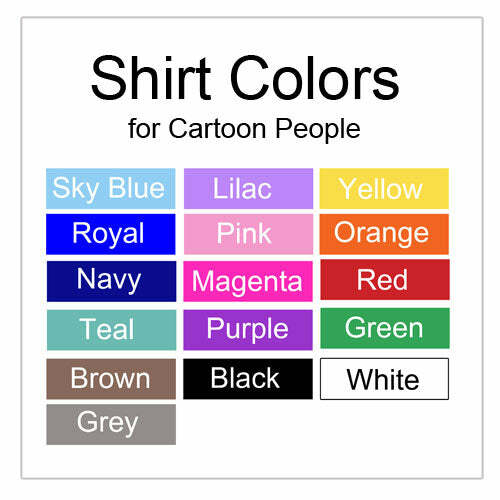 See the colors and clothing tab for examples of all the colors and things you can add to your people!